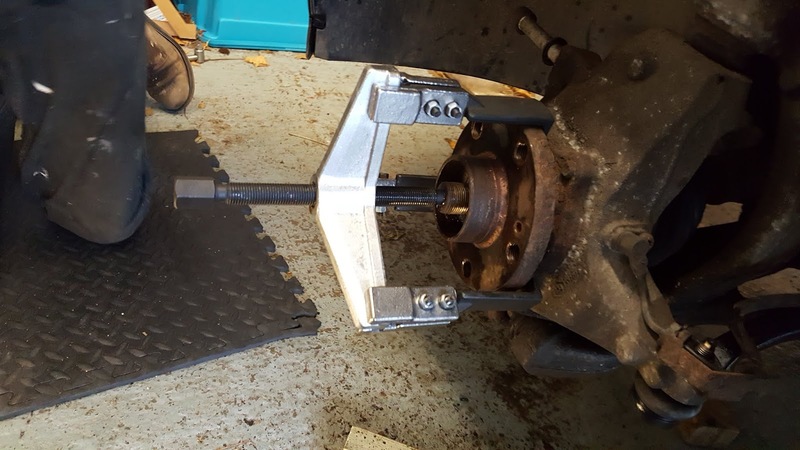 Can I take the front suspension strut out of my Clio 197 at home? The answer is "Yes, I just did it, but you need some weird and wonderful tools". 32 mm socket and a good sized breaker bar. 3/8 Whitworth ring spanner or 18mm if you have some kind of metric fetish. The first job is to pull off the wiper arms. No honestly! 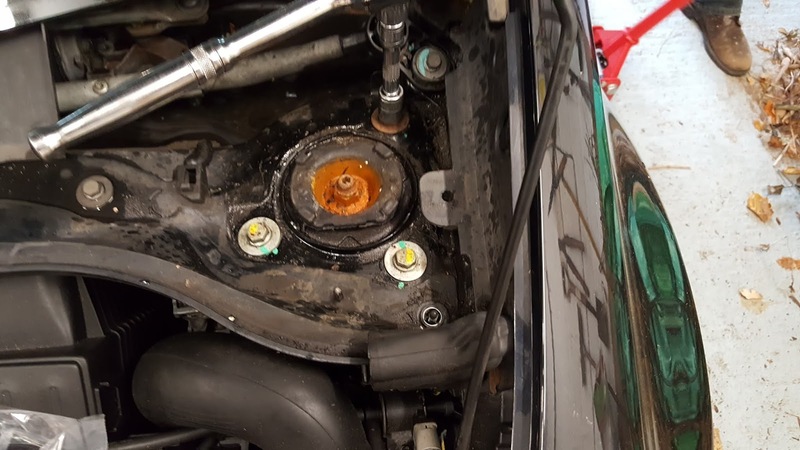 You're dropping a major suspension component out of the bottom of the car. Start with the windscreen wipers. Then you can pop off the scuttle cover. There are two plastic plugs with a screwdriver slot, the rest of it just prises off. Then you can take off the top-mount cover. With the road wheel off the car it is quite easy to push the centre cap out. It comes outward away from the car. It is now time to jack the car. Don't work under a car on a jack - put it on stands. You need the front of the car a reasonable distance off the ground so I strongly recommend that you put it on 4 stands to keep it level. 2 under the front subframe, 2 on the rear jacking points. 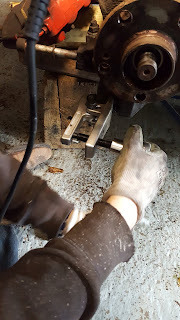 The brake caliper is held on with two bolts with 12mm hex key heads. 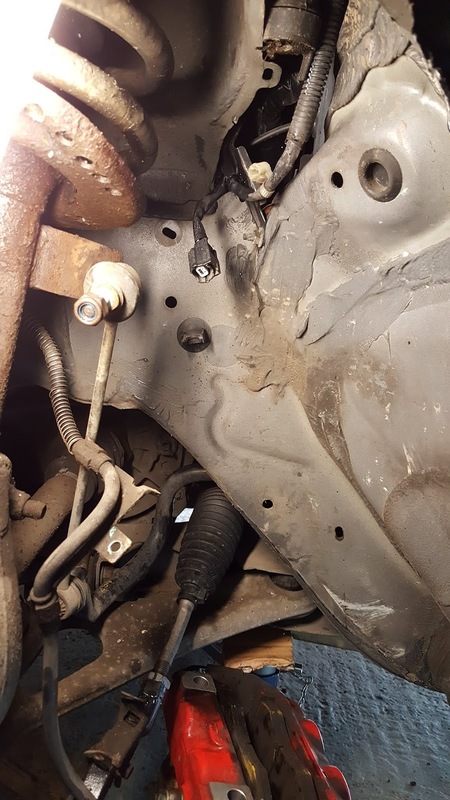 Don't leave the caliper dangling on the brake hose. Support it on a precarious pile of tool boxes and bits of wood. You can now take the brake disc off. Once the wheel is off it is only attached by two tiny star drive screws and years of corrosion. Take out the screws and encourage it away from the car with a heavy hammer. The front suspension is perfectly mundane in that it has a bottom wishbone and a Macphearson strut. It is unusual in that the strut is linked to the wishbone and the entire hub-carrier assembly is attached to the strut on a pair of pivots. It is only the hub-carrier assembly that steers. Some of these have 17mm nuts, some are 3/8 Whitworth, and some are 19mm. The anti rotation link has a star drive in the shaft so you can stop it from turning, you have to reach through the middle of the 3/8 Whitworth ring spanner with the star drive key. 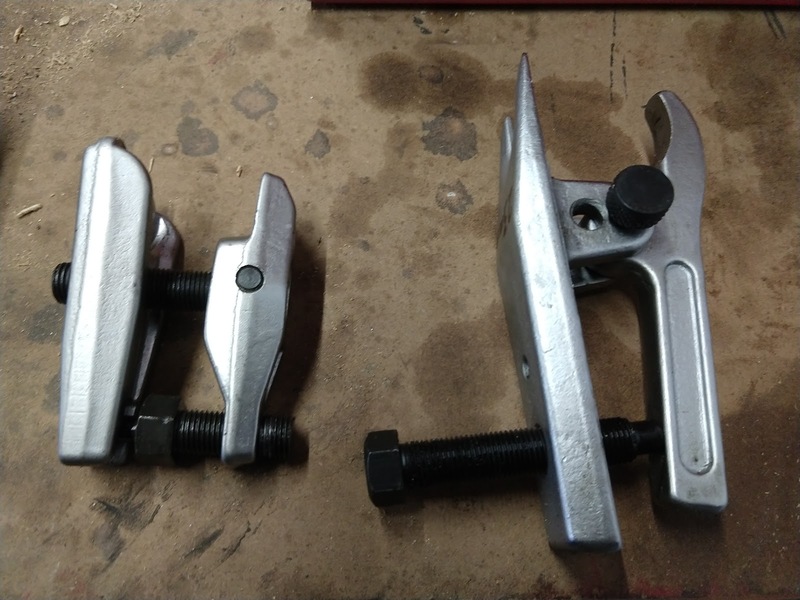 Apparently owning a ball joint splitter this small means that I'm a homosexual, but I used a Fischer Price My First Splitter Laser 3525 with great success for the track rod ends. I also own the more manly Laser 2708 which I had intended to use for the bottom ball joint. The jaws are 19mm apart. As best as I could measure the diameter of the taper amongst all the grime and the rubber boot you need a 22.5mm gap between the jaws. Some splitters have a 22mm gap, so perhaps one of these would just fit. I opened mine out to 23mm with a file and did manage to split the bottom ball joint with it - and one stout blow from a sledgehammer. You have to take the entire wheel arch liner out. There are three flimsy self tapping screws and several "fir tree" plastic plugs that you prise out. I bet you destroy at least one of each. The connector for the cable is clipped to the inner wing. Undo the hub nut and push the drive shaft splines out of the hub. 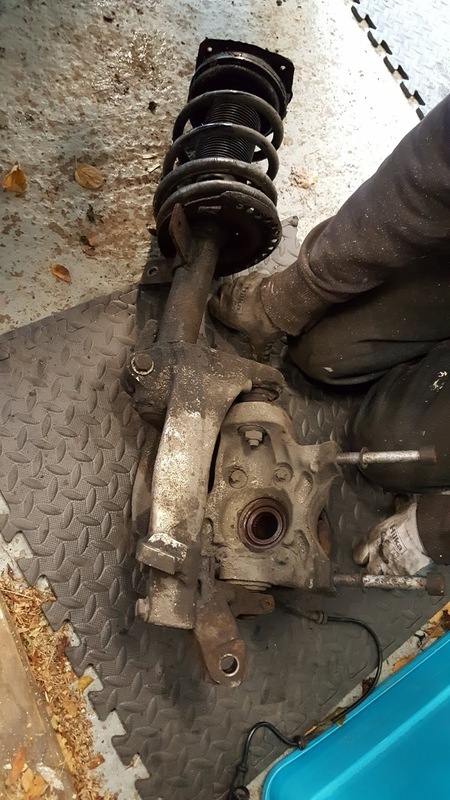 I had a "universal" hub puller and it was nowhere near big enough. Thankfully a friend had lent me a large three jaw puller. I didn't measure the diameter of the hub but it's not small! 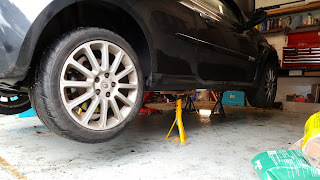 You now support the weight of the strut and wrestle it out of the car while your apprentice undoes the three top mount bolts. The torque wrench is to do the hub nut up again afterwards. In our case we were changing the pivot at the bottom of the hub carrier assembly. There's a pinch bolt that attaches the bottom half of the strut to the stanchion. 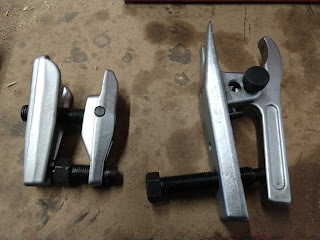 The bottom half of the strut is in two parts and held together by three bolts. The teeny tiny pinch bolt that holds the strut to the bottom of the hub carrier assembly (the bit that steers) has a 4.5mm hex key (WTF?) and was impossible to remove intact. The top pivot is a large ball joint and was challenging and frightening to split. We couldn't change the pivot ourselves. It ended up in an 18 tonne hydraulic press and was reluctant to leave.